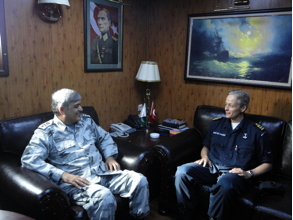 In June 2013, Commander, Combined Task Force 151 (CTF 151), Commodore Muhammad Ihsan Qadir SI (M), met with Commander Adriann Van De Sande of the Royal Netherlands Navy. Commander Van De Sande is the Commanding Officer of HNLMS VAN SPEIJK (F828), which is part of the NATO-led, Combined Task Force 508 (CTF 508). The meeting between the Commanding Officer and the Commodore took place onboard TCG GOKSU (F-497), the CTF 151 flagship, while the ship was in port in Salalah, Oman. The mission of both CTF 151 and CTF 508 is to disrupt, deter, and defeat piracy in and around the Gulf of Aden, Arabian Sea, Indian Ocean and the Red Sea—an area that spans approximately 1.1 million square miles. This meeting allowed Commodore Qadir and Commander Van De Sande to share their experiences and the knowledge they have gained while patrolling in the Gulf of Aden and off the coast of Somalia. During the meeting, Commodore Qadir and Commander Van De Sande acknowledged the importance of the Internationally Recognised Transit Corridor (IRTC), which runs through the Gulf of Aden. Over 20,000 ships transit this corridor each year, making it a crucial gateway for international shipping. As a result, both CTF 151 and CTF 508 have made patrolling the IRTC a priority to deter piracy and reassure the maritime shipping community.